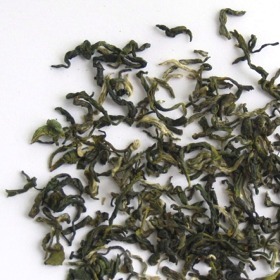 Mao Jian White Tea has attractive long green curled leaves with silvery tips. Only the most tender tea shoots are picked. Mao Jian White Tea is famous for its delicate subtle sweet taste and fragrant aroma. Its flavor is full and crisp. Our Moa Jian White Tea is harvested during Spring. Although tea can be harvested from spring to autumn, the leaves cropped in the spring time give a better brew. Mao Jian White Tea is a great choice for everyday drinking. Crisp and clean, less grassy aftertaste compared to green tea. It has a smooth finish, with a little of the airiness of a white tea. Long green curled leaves with silvery tips. Clear yellowish liquid. This is a very smooth and flavourful tea. Im not a big fruity or spice flavour tea person, so this is just perfect. This is a refreshing tea, nice flavour and aroma. This is a very good tea, great flavour and nice aroma. This is a really good tea, a good taste and aroma. This is just a good tea to drink in the fresh mountain air. Nice aroma, smooth taste, very relaxing on a quiet Sunday morning.